I’ve never been a person who makes concrete new year’s resolutions, but I always believe in being more productive —from reading, blogging, writing, to cooking! So let’s start the year off with a recipe post, shall we? One dish I enjoy ordering from Chinese restaurants is Lemon Chicken. I’m not sure if it’s truly a Chinese dish — so many dishes we find in local Chinese restaurants aren’t really authentic — but since I found it in a Chinese cookbook, perhaps it is. This version, however, doesn’t have the bright yellow color the Lemon Chicken of most local chains have. Understandable because this recipe doesn’t call for any coloring, whether artificial or natural. The chicken comes up nice and crisp, so while the original recipe calls for you to toss the fried chicken in with the sauce, you can also opt to serve it on the side as a dipping sauce instead. Slice chicken into larger than bite-sized pieces. Mix soy sauce, rice wine, spring onion and garlic in a bowl. Pour over prepared chicken, then let it marinate for at least one hour. Overnight works better. Pour the beaten egg into the chicken. Toss lightly to coat, then drain excess liquid. I also like picking out any leftover onion and garlic bits, since they tend to burn quickly while the chicken fries. Dump the chicken in a plastic bag or in a roomy sealed container. Add the cornstarch then shake to coat well. Heat the oil in a wok to 375-degrees F. If you don’t have an oil thermometer, it should be hot enough to fry a piece of bread golden brown in ten seconds. Fry the chicken, a few pieces at a time, until golden brown. Drain. Repeat with the rest of the chicken until all pieces are cooked. When all the chicken pieces are done, refry them altogether in the hot oil until crisp. This second frying ensures a crisp coating for the chicken. Make the lemon sauce by combining all the sauce ingredients. Cook the lemon sauce in your hot wok (don’t forget to drain the frying oil first), stirring constantly until thickened. Toss the chicken in the sauce. Serve while hot. I love lemon chicken!! 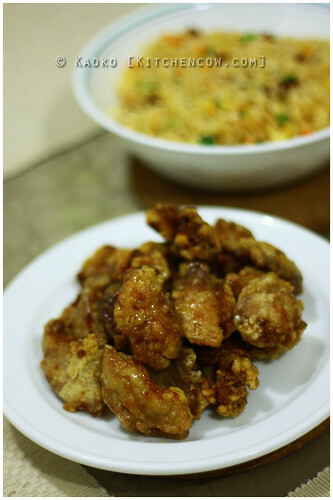 I have a recipe for honey lemon chicken that I did for Yahoo that I like to use too. I am and absolute sucker for shiny, sticky, sweetish Chinese food! Wishing you a great 2014!! I looked up your website for my Luna East post…then I saw this recipe. My favorite Chinese dish! I don’t want to look at your website anymore, nakakagutom!